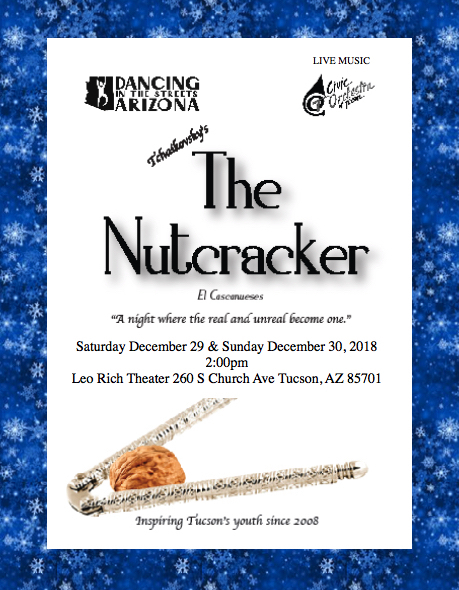 Dancing in the Streets AZ presents the 11th Season of The Nutcracker Ballet with live music by The Civic Orchestra of Tucson. Prima Sponsorship $15,000 You will receive 15 tickets; a Thank You and full page color ad in program; an announcement of recognition by Emcee during event; logo recognition in all printed and media publicity, including press releases (November end-of-month deadline); mention on website and Facebook; with advance notice: student dance presentation at your event or place of business; meet and greet post ballet gala, and pictures with principle dancers for you and your 15 guests. Nutcracker Sponsorship $10,000 You will receive 10 tickets; a Thank You and full color ad in program; an announcement of recognition by Emcee during event; name recognition in all printed publicity and media publicity, including press releases; mention on website and Facebook; with advance notice: student dance presentation at your event or place of business; post ballet production pictures with principle dancers for you and your 10 guests. Cavalier Sponsorship $1,500 You will receive 4 tickets; a Thank You and half-page black and white ad in program; name recognition in all printed and media publicity, including press releases; and mention on website and/or Facebook. Gingerbread Sponsorship $500 You will receive a Thank You and business card size black and white ad in program. Keep up to date on our shows and other DITSAZ news. We send just a few emails per year. Dancing in the Streets will never share your information with any one.